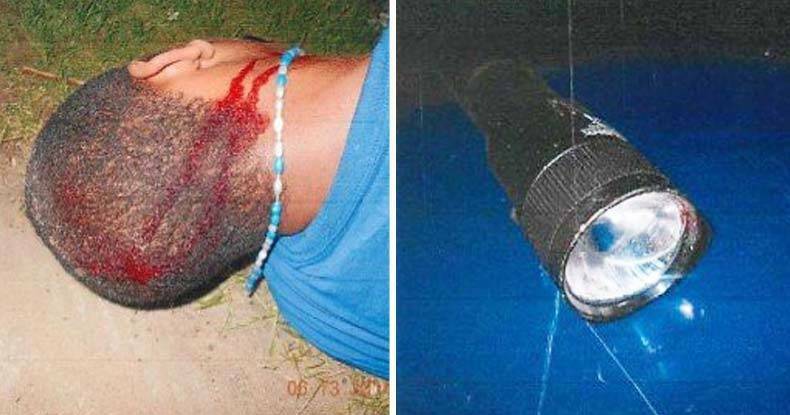 Grand Rapids, MI — Suffering permanent physical and mental damage after a Michigan police officer savagely beat his head bloody with a flashlight, an unarmed teen recently filed a federal lawsuit against the cops for violating his Fourth Amendment rights. Although the teen was cleared of the charges against him, none of the officers involved in the beating received any disciplinary action. Around 9 p.m. on June 13, 2014, then-15-year-old Donovann Austin Braswell was hanging out with four other black teens when officers, searching for an armed man, ordered the kids to stay put. Instead of complying, Braswell and two others fled on foot. As Braswell attempted to climb over a fence, Grand Rapids Officer Sean McCamman grabbed the teen and threw him to the ground before repeatedly striking him in the head with his flashlight. Breaking his flashlight on the teen’s unprotected skull, McCamman proceeded to hit Braswell with his fists while officers Nathan Mead and Peter Thompson stood by, failing to intervene. Accused of tossing a revolver as he ran, Braswell was charged with resisting arrest, obstructing police, and carrying a concealed weapon. A jury later found Braswell not guilty of the concealed weapon charge, while Kent County Circuit Judge Kathleen Feeney dismissed the resisting charge after determining the officers did not have reasonable suspicion to stop the teens. Newly released photos revealed Braswell’s injured head bleeding from multiple crescent-shaped wounds caused by McCamman’s bloodstained flashlight. Braswell also received several stitches in his head and defensive wounds along his left hand. According to his attorneys, Braswell now suffers from severe headaches, muscle spasms, nausea, vomiting, and speech problems. His cranial injuries are also responsible for delaying his high school graduation and inability to continue playing sports. Last week, Braswell’s mother filed a federal lawsuit on behalf of her son accusing officers of using excessive force and violating his Fourth Amendment rights to be free of unreasonable search and seizure, excessive force, and prosecution without probable cause. The lawsuit also alleges that all three officers provided false and misleading information to prosecutors in a failed attempt to wrongfully convict her son. Although the officers claimed they saw Braswell toss a gun, prosecutors failed to convince the jury that the revolver belonged to the battered teen. According to Braswell’s attorneys, none of the officers involved in the vicious beating received any disciplinary repercussions for their actions in ruthlessly attacking an unarmed minor and wrongfully arresting him. The Free Thought Project contacted the Grand Rapids Police department but have yet to receive a response in regards to this case.